Charlie Boyle, a native of Killybegs, heard many stories from his grandmother and her contemporaries about Mass Rocks in the locality. During the 1960s he spent countless days and months scouring the countryside in search of those hidden gems of faith. Fifty years later Charlie was delighted to accompany the local parish community in celebrating Mass at those sacred sites. This is the story of present-day pilgrims making a tangible and deeply-felt spiritual connection with the faith of their ancestors. Book Launch on Friday 29th November 2013 at 8pm in The Tara Hotel, Killybegs. All welcome. Refreshments. Available from: Parish Office, Killybegs, Co. Donegal. Tel. 00353 (0)74 9731013. 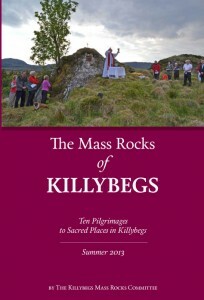 It’s a 104-page publication, with over 250 photos, capturing the spirit of the Killybegs Pilgrimages in the Summer of 2013. Cost: €15.